Featherstone as we see it today was a very different place at it's beginnings many hundreds of years ago. The main reason this place was populated was rivers sources running through the area. Two main rivers ran through here in prehistoric times. These were the river Went and another river running past Ackton across the old Ackton hall colliery site, through the Mill pond area and into the river Went behind Priory play area. That particular river dried up hundreds of years ago. Celtic tribes occupied area either side of these two rivers well over two thousand years ago and artifacts including flint, coins and brooches have been found in these areas. The rivers were very wide and powerful rivers much like the rivers Aire and Calder are today but modern farming and mining have reduced the size of the rivers today. 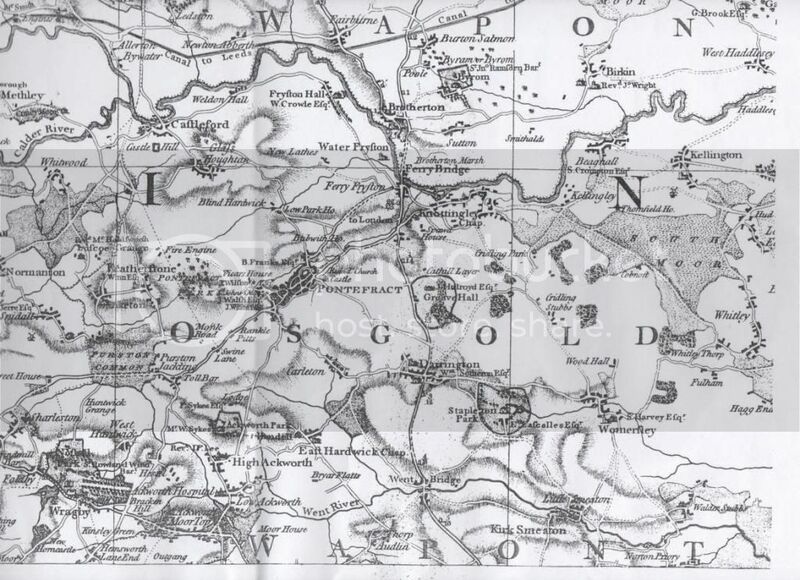 The Romans were in Featherstone and Purston after the roman invasion of AD43 although they didn't occupy the region till 20-30 years later. Green lane in Featherstone was a Roman road called High street and it formed part of a road which came through New Sharlston, Streethouse along Green lane and down Halfpenny lane. Eventually meeting another Roman road Erming street which joined Doncaster to Castleford. The road in New Sharlston is still called High street and Streethouse owes it's name to the road. The town was occupied by the Anglo Saxons through the dark ages although there hasn't been many finds made from this period. Medieval times were different though. The town was two seperate villages which were Featherstone and Purston Jaglin. Featherstone was where North Featherstone is located now and the church there today was originally built in the 1300's, the first ever vicar was called Thomas De Thirnum. Purston Jaglin was a small villiage with farms round about, mainly located at the top of little lane where there used to be an hospital. The main road today from Featherstone to Pontefract didn't exist till much later and the way to get to Pontefract from here was down Halfpenny lane or across the old coach road behind Purston park, where you turned left and joined Ackworth road near to where the Plague stone is. 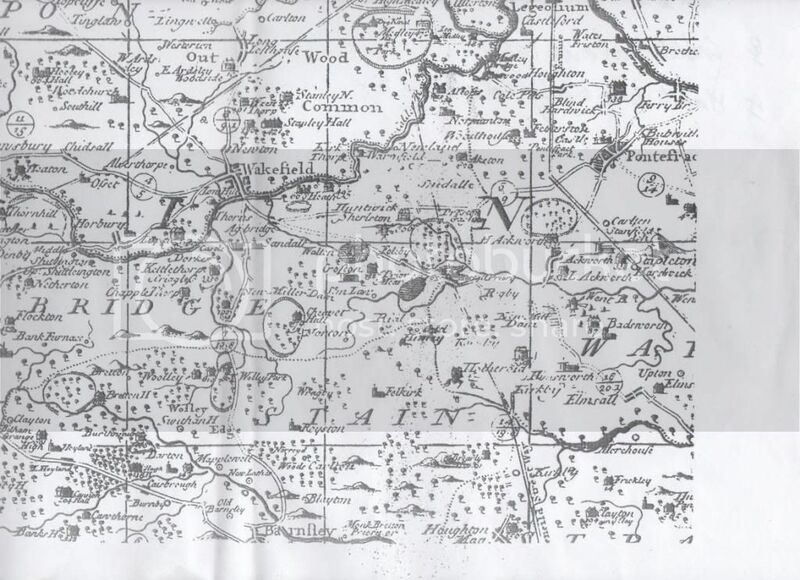 There may have been a road from Purston Jaglin to Pontefract which went though the grounds of Featherstone high school, Ravensmead along Copley's farm eventually reaching Mill hill in Pontefract and passing the Valley gardens but this road hasn't been researched properly. The two villages changed forever with the introduction of mining in the 18th century, the population exploded with the introduction of mining with houses being built to accomodate the workers. The boundaries were changed and shaped into what we see today. I remember him writing that. He put a lot of work into it. 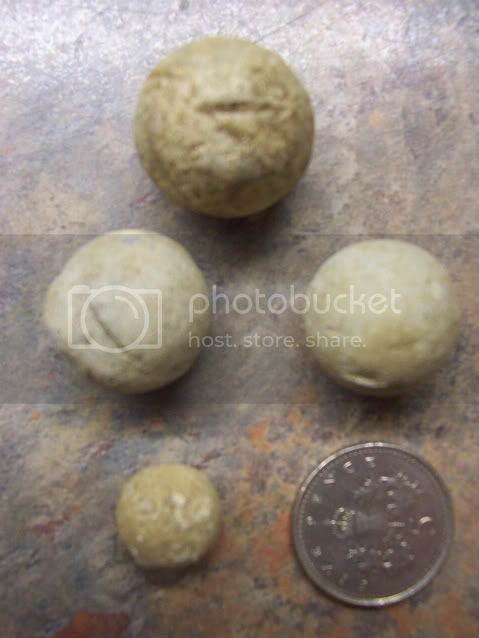 A friend of mine has kindly given me these lead balls/ bullets/shot that he has recently found in Featherstone. After taking them to Pontefract museum he is informed they are about 1700. The large ball is part of shot used in a blunderbuss. I wouldn’t like to feel 20 fired at once. The medium size pair are from a rifle. The small single ball is from a pistol. The balls are heavy and the marks from the moulds can still be seen. The balls have scratches on them. Apparently they are either marks made from the gun barrel or rats teeth when the dead body was eaten. Thats a another good possiblity Glyn. Here is an interesting one. Behind the scenes since the Indy’s arrived the labour party in general have pursued every avenue to halt anything that rightfully should be ours. Yet another great example that will not be insignificant to many but could be hugely significant to the financial status of Featherstone is simply its heritage. Featherstone is not just an old village it is an ancient area of settlement. Not just old but old enough to be Neolithic. This is something that a small number of individuals have worked on for years and have pushed forward. Their advertising has now turned the eyes of the world to Featherstone. So what has the local labour party got to do with it? Interestingly No 10 Downing Street has been in contact locally requesting to be informed why when a senior labour M.P. visited the area that the “new signs” promoting Featherstone heritage were not in place? Apparently it did not take long for the trail to lead to yet another rogue member shelving the works. Looks like after a considerable amount of work by a few that Featherstone will be truly placed on the world globe. A recently passed away friend appears to have had a little collection of items concerning Featherstone. His family has passed these on in the hope they will be of interest and not just pieces of paper in the bin. There are no details of copyright on them or any print markings. They look like copies. No idea of age other than old. Interesting to see Featherstone way back in the day.